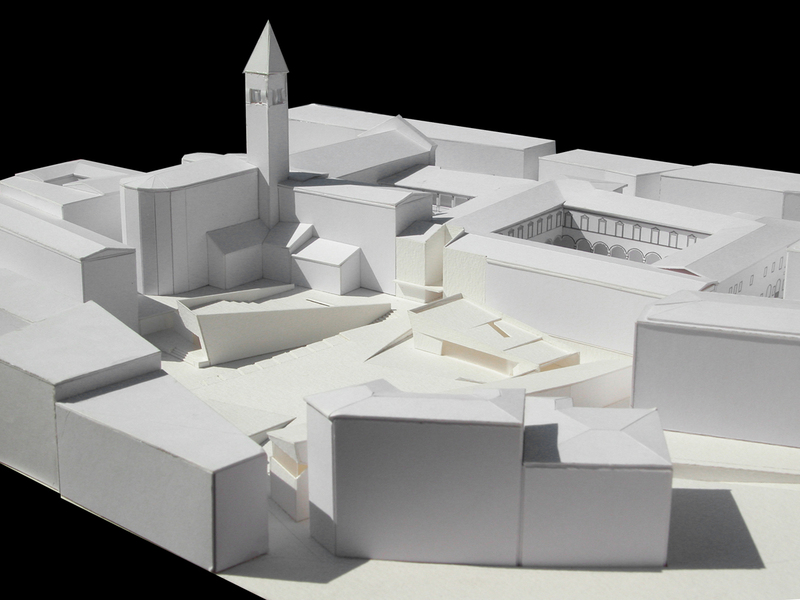 International competition for the extension of the Archaeological and natural Museum and for the re-design of the public Santa Corona square, Vicenza. Recognizing the urban and architectonical value of the area of intervention was a key element to the proposal. The intention behing providing a square to the zone, relates directly to the necessity of crossing it in a longitudinal way and, therefore, allowing public access through the Santa Corona complex. When allowing this access, it is necessary to rethink the convent’s main entrance, as well as its circulation system. In this manner, the big cloister becomes, at its western side, a public passage during the opening hours of the museum and, at its eastern side, a new entrance. In terms of technique and materials, the project literally proposes to close the “crater”, product of the bombs. It is then, an intention to generate a new passage which metaphorically evokes the destruction after the war. The square is reconfigurated by means of big stone surfaces. These form a sytem of plates at three different levels which finally transform into buildings. At the lowest level, at Canove Vecchie, there is an entrance square to the conference hall as well as paths that connect the museum and the parking spaces. At the intermmediate level, there is a slightly tilted surface which elevates in direction to the museum. Finally, at the highest level (which corresponds to the same level of the museum) the square is articulated throughout the use of terraces that connect to the bar area and the museum entrance. The conference hall roof is then used as a livable space, with a beautiful view, perfect for musical and theatrical open-air activities. At the interior of the complex, the project proposes the recomposition of the cloister, the reconstruction of the dominican library, the extention and organization of the natural and archeological sections of the museum, and new spaces for temporal exhibitions, a bookshop and a cafeteria. Giorgio Lombardi (capogruppo), Glass Architettura Urbanistica.